Prime Minister Trudeau is finding out just how difficult it is to navigate his pro-pipeline fossil fuel agenda during an era of climate change. The fact that climate-warping mega projects such as the Energy East and Kinder Morgan pipelines will likely never see the light of day must be tormenting the PM. During his address to fossil fuel executives at Houston’s CERAWeek conference in March 2017, Trudeau boasted that “No country would find 173 billion barrels of oil in the ground and just leave them there. The resource will be developed. Our job is to ensure that this is done responsibly, safely and sustainably,” said Trudeau. 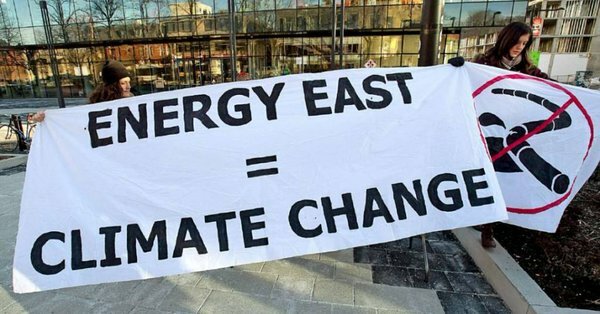 Well not so fast writes Aurore Fauret (350Canada’s Energy East organizer) in her blog republished below (with permission). In the midst of disastrous climate events — hurricanes, floods, wildfires, and the inhumane policies of deportations that are compounding these injustices — we’ve got some good news. [Recently], TransCanada announced that it was requesting a 30-day suspension to the Energy East review, to assess the viability of its pipeline project given new review constraints. That’s because last month, the National Energy Board (NEB) — the regulatory body tasked with evaluating pipelines — announced that it would include climate change impacts in its assessment of the project. Including climate impacts seems like a no brainer for a project that is the largest tar sands pipeline ever proposed. But it wasn’t always that way. There’s a whopping 4,500 km of pipe destined to export 1.1 million barrels of oil every day, extracted from Alberta’s tar sands. The product would be shipped out through the Bay of Fundy in New Brunswick to foreign markets. Up until two months ago, the NEB was going to assess this project without considering the toll burning all that oil would take on the climate. Like many others, I’ve spend hours — both as a volunteer and in my work life — supporting the nation-wide opposition to this project. So I’d like to dwell for a minute on how we got here and celebrate this important milestone. A quick recap of recent history will remind us that in 2012, Stephen Harper changed a lot of laws at once with his Omnibus Bill C-38 (among others) which included an overhaul to the NEB, making it harder for the public to participate, easier for industry to expedite applications, and gave more power to politicians to decide the ultimate fate of these projects. With no consideration of climate change in its reviews, the NEB became a “captured regulator”, for the benefit of Canada’s fossil fuel industry. Shortly after Energy East was proposed to the NEB, a campaign called the People’s Intervention got off the ground, supported by a number of organizations. It called for climate change to be included in the assessment of the project. First, 100,000 people signed a petition asking for the NEB to include climate impacts. Next, close to 2,000 people actually applied to the NEB as intervenors in the project, asking to talk about Energy East’s impact on climate change. Then, hearings and open houses were held along the pipeline route and communities came out en masse to voice their opposition and demand a climate test on the pipeline. Finally, many more showed up for a People’s Injunction, to hold the newly elected Trudeau government’s feet to the fire on delivering its promise of fixing the broken NEB process. Two years later, climate change is now included in the review, forcing TransCanada to pump the breaks on the project. We won this round. In the process, the NEB was so far delegitimized that a profound reform to the regulatory framework became a key 2015 election issue. The review for Energy East got suspended, dissolved, amended, and reset multiple times. By demanding climate accountability we’ve made it nonviable for TransCanada to move forward with its project. 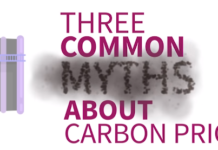 Including climate in the review says simply: if you’re going to propose a project that releases massive amounts of greenhouse gases into the atmosphere, then you’ll be evaluated against the standards we’ve set for our ability to live safely on this planet. There’s nothing extreme about it, it’s just the true cost of mega-infrastructure projects in line with the science. But imagine for a second what headlines we’d be reading today about this “done deal” pipeline if it wasn’t for the thousands of people who took action? Over the course of the last years, this pipeline project dubbed as a “nation-builder” did indeed connect people across the country — in opposition to it. A vibrant network made up of students, faith groups, Indigenous leaders, environmental NGOs, grassroots associations, local businesses, farmers, workers, mayors, all engaged in legal battles, local and regional organizing, and creative troublemaking to change hearts and minds. Among the inspiring regional actions I’ve had the privilege of joining from coast to coast, I remember participating at the Red Head March at the End of the Line in New Brunswick, taking a few steps with Anishinaabe women at the Treaty 3 Water Walk in Manitoba, marching alongside thousands in Quebec against the Cacouna port. Through these and countless other big and little moments that each would deserve to be highlighted, you could feel the pulse of a powerful movement. The fate of Energy East is of course linked to other tar sands pipelines, and if there’s one thing we’ve proven it’s that people are rising for a just transition off fossil fuels and towards renewables everywhere. Two other projects in the works are still facing massive opposition from First Nations and allies, despite approvals. Keystone XL is seeing solar panels built in its pathway in the US, and Kinder Morgan is facing tiny homes installed on the pipeline route in British-Columbia. We don’t know for sure what TransCanada will do next, whether it will abandon this folly or still refuse to give up on Energy East. Regardless, we’ll be continuing to lead with strategies that work, like the climate review one, and scaling up to continue to take on destructive projects. If you too have been feeling despair at the horrifying flames and floods around the world, this is a good reminder that when people come together and communities organize, campaigns to take massive carbon projects out of the equation can actually work. Now, go ahead and find one to join. Aurore Fauret is a campaigner @350/@350Canada on #climate justice | Organise des mobilisations #climat. 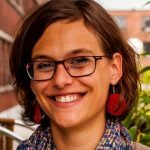 She has experience working with a range of advocacy non-profits and grassroots organizations, as well as coalitions and partnerships for human rights, climate change and economic justice.